The SmartPhone/Tablet Home Button DOT™ is a sticker that makes using your smartphone or tablet home button easy. The domed grip allows you to easily find the home button. It's made of 3M repositionable adhesive so it leaves no sticky residue. The printed logo makes your smartphone or tablet easy to identify. 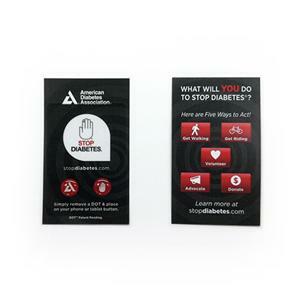 Comes with two DOTS, one with the Stop Diabetes logo and the other with the American Diabetes Association logo. Made in the USA. Works on most brands of smartphone and tablet home buttons including iPhone and iPad.